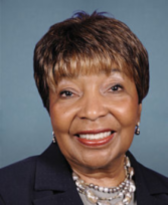 Eddie Bernice Johnson is the first registered nurse elected to Congress and can be counted among the most famous nurses in history because of her outstanding accomplishments in that capacity. As an African-American woman, she has overcome many obstacles in both her nursing and political careers. Ms. Johnson was born in 1935 and grew up in Waco, Texas. She was interested in studying medicine but because of her race could not attend college in her own state. Leaving Texas, she attended St. Mary's College at the University of Notre Dame in South Bend, Indiana and received a diploma in nursing in 1956. Returning to Texas, she later earned a bachelor of science in nursing at Texas Christian University and, in 1976, a master's degree in public administration from Southern Methodist University. Ms. Johnson's nursing career was spent in the psychiatric field. After obtaining her advanced nursing degree, she served as chief psychiatric nurse and psychotherapist at the Veterans Administration Hospital in Dallas, Texas. She held that position for 16 years before deciding to enter politics. In 1972, Eddie Bernice Johnson won a seat in the Texas House of Representatives and became the first African-American woman from Dallas ever elected to public office. In 1977, her experience and education in health care led President Jimmy Carter to appoint her as regional director for the Department of Health, Education and Welfare, making her the first black woman to hold this job. Johnson again entered politics in 1986 and was elected to the Texas Senate. As would be expected, her concerns centered around health care, education and racial equality as well as public housing and economic development. In her position as a state senator, she wrote legislation regarding health care and racial discrimination. She was an activist, holding hearings, investigating complaints and testifying to a federal court about racism. In 1992, Johnson made a risky move and retired from the Texas Senate to run as representative for the newly formed 30th congressional district. She won by a landslide and has won every re-election since. Her tenure as congressional representative has shown her to be an effective and dedicated leader. Congresswoman Johnson is an active member of many House committees and is an outspoken advocate of science, technology, engineering and math (STEM) education. Ms Johnson is an outstanding example of the value of education. She feels that her nursing education prepared her to make a difference in the world. Her strong feelings about nursing led her to introduce the National Nurse Act of 2011.This bill recognizes the many contributions that nurses have made in public health and disease prevention. It elevates the importance of the Chief Nurse Officer of the United States Public Health Service and states that nurses are in the ideal position to promote social justice and wellness to Americans. She also proposes that the government appoint a National Nurse to work with the Surgeon General to promote wellness and health literacy. Eddie Bernice Johnson believes that nurses have the education and knowledge to be very effective in the political arena. She encourages other nurses to share their gifts to make the United States a better place for everyone.